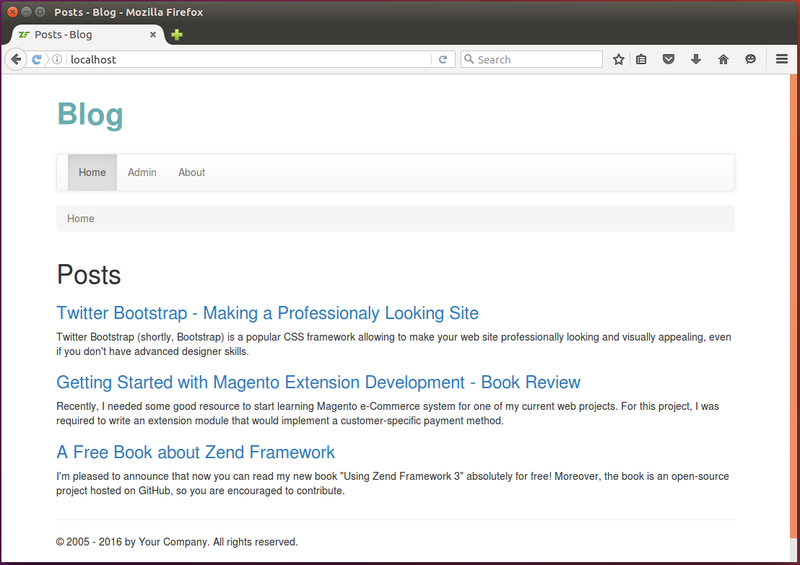 To show how to use EntityManager class, we will create the main page for the Blog web application. This page will display the list of posts sorted by date in descending order. // Constructor method is used to inject dependencies to the controller. // Posts page containing the recent blog posts. In the code above, we first add the __construct() constructor method which is used to inject the Doctrine entity manager into the controller (lines 17-20). Inside of the indexAction() method, we get the repository of the Post entities with entity manager's getRepository() method (line 27). With the findBy() method provided by repository, we select published posts sorted by date in descending order. And, in line 32 we pass the selected posts to the view for rendering. In the code above, you can see how we instantiate the Doctrine entity manager and inject it into the controller. In the view template above, we go in turn through the posts we selected and render each one's title and content. That simple! Now, if you open the Blog web application in your browser, you should be able to see the following page containing the list of posts (look at figure 12.6 below).